Difference between revisions of "Deep Learning for Cerebellar Ataxia Classification and Functional Score Regression"
|'''Figure 1:''' Example coronal sections of the cerebellum from HC and three ataxia types. We train ''K'' weak classifiers/regressors on ''K'' image subdomains separately, and then learn a classifier/ regressor ''C'' to combine the decisions from weak classifiers. Each of the ''K'' image subdomains is a square plane of the same size, but with different locations and orientations. The image subdomains are chosen so that they are distributed evenly across the whole volume. Then we move on to training the combined classifier/regressor. Perturbing the image subdomain to increase the training samples. We do this by generating a training sample for ''C'', for each image subdomain ''k''. An image [[Image:LCA_Sikmj.png]], is randomly selected from [[Image:LCA_Qik.png]]. The selection is carried out independent among different image sub domains. [[Image:LCA_Sikmj.png]] is in turn input into SAE to generate a feature vector [[Image:LCA_Sikmj.png]], and weak classifier/regressor [[Image:LCA_Rk.png]] to generate an output. The feature vector for a training sample is then formed by concentrating the outputs from all [[Image:LCA_Rk.png]]. We then generate multiple training samples from each training subject by repeating the above procedure. |'''Figure 2:''' (a) Image subdomains. (b) Method Diagram. Then comes the testing stage. Given the image of a test subject, multiple samples are generated in a similar way to process of generating training samples for the combined classifier/regressor ''C''. Each training sample will be assigned by ''C'' the class probabilities in the case of classification or a predicted score in the case of regression. For classification, the final output is the class that has the maximum average class probability output by ''C'' from the multiple samples. For regression, the final score is the average score predicted by ''C'' from multiple samples. |'''Figure 3:''' Predicted FSFA vs. true FSFA, using the proposed method. Typical MR images of the cerebellum are shown. After testing cerebellar ataxia classification, we tested functional score regression. 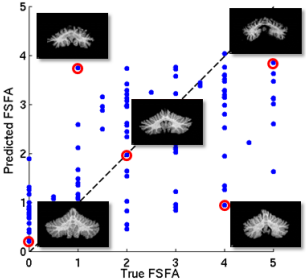 In this experiment we consider the regression of functional staging score for ataxia (FSFA) We applied a 10-fold cross validation on a dataset of 120 subjects which have FSFA evaluated evaluated. Five methods are compared and table 1 shows that our proposed method with SAE outperforms the other methods in root mean square error (RMSE), and is compatible with the lobule volume PCA for Pearson’s correlation coefficient. |'''Table 1:''' Root mean square error (RMSE) and Pearson correlation coefficient between the measured functional score and predicted functional score. Table 1: Root mean square error (RMSE) and Pearson correlation coefficient between the measured functional score and predicted functional score. This page was last modified on 25 August 2016, at 09:58.